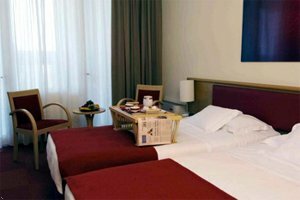 The Best Western Hotel Farnese International completely refurbished and renowned is one of the most modern accommodation solution in Parma. This Hotel in Parma is strategically located and can be easily reached both from the Circular road and from the highway and it is located a few minutes from the city centre (500 mt), the Parma Fair, the Giuseppe Verdi Airport and the railway station, 1.2 km. 76 rooms are available, 17 no smoking, both with queen size bed and superior rooms with king size beds. Wide parking for coaches too, a garage, perfect equipped meeting rooms, a bar and an excellent restaurant to taste the best dishes of both Parmesan and International cuisine. Free special facilities for pets: food, material for their toilet and boxes for the night.